People not visiting the Cité du Chocolat can have lunch at the Comptoir Porcelana from 12 noon and 2.30pm. The Comptoir Porcelana has disabled access. Please ring the intercom on the right of the restaurant's ground floor entrance. While visiting the Cité du Chocolat, pop in to The Comptoir Porcelana, our self-service café! Take a mouth-watering break to enjoy an unbeatable dessert, snack or hot chocolate. Or more surprisingly, and perhaps for the first time, sample a savoury chocolate dish. Going further than traditional recipes that use chocolate to bind sauces, the creations served at Le Comptoir Porcelana subtly blend chocolate or cocoa with meat, fish or vegetables to offer first-time taste sensations. This self-service café is operated in an eco-friendly way. An all-chocolate experience to melt your heart! At Valrhona, we are convinced that by involving all our stakeholders we will succeed in meeting the challenges of tomorrow’s world. 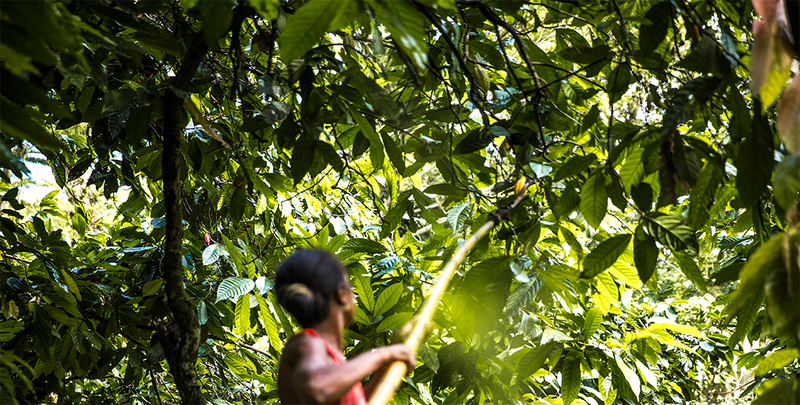 For years, we have been cultivating long-term relationships with our cocoa partners. Our responsibility programme involves our employees, suppliers and customers. We aim to halve our ecological footprint by 2025. This is why the Comptoir Porcelana has opted, as far as possible, to use tableware that is either naturally derived, compostable, biodegradable, or else recyclable. This disposable tableware reduces our consumption of cleaning water and will be upcycled, primarily via a bio-waste collection scheme. To keep our chocolate cassolettes (shepherd’s pies) hot during service hours, they are served in ceramic bowls made locally by Drôme company Revol. Our trays are made from paper fibres and sugar-cane resin. We kindly ask our customers to help sort waste in the area provided. Our cutlery is made from CPLA (corn and potato starches). Our clear cups for cold drinks are made from PLA (derived from starch fermentation). Our salads are served in cane-pulp salad bowls. Our desserts are served either in wooden moulds with suitable baking paper or in recyclable plastic recipients.